to the early birds and all who follow!! Pretty blue bottles all in a row. 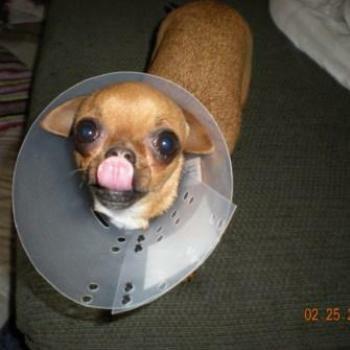 Ahh, the dreaded 'Elizabethan' Collar - No Fun! Big collar for such a little pooch. There has been so much rain in this area that warnings have been issued to watch for trees toppling over due to soil so saturated that the trees can fall over, without any wind pushing them. M R C E E !!! I say that a lot, Keith! Long time no Cee. Glad to SEE you posting again. Both of the two Cees at once! I can c them 2! Anne gets a thumb up, also.